NO DISCOUNTS ON LITERATURE - ALL POSTPAID within the U.S. unless otherwise noted. Overseas buyers should inquire about extra shipping costs. Most literature is sent by Media Mail except smaller items, which may be sent by First Class mail. If you use the secure order form, do NOT check CSA member (if you are one) as that automatically applies a CSA discount which will gum up the transaction. If you are ordering something other than books as well, please submit your literature order separately. Edited by Patricia A. Kaufmann, Francis J. Crown, Jr., and Jerry S. Palazolo. The standard editions are sold out from the publisher, but still available is the DELUXE EDITION. The standard edition is available periodically from the second hand market. This limited run of the deluxe edition features a slipcase, gilt-edged pages, a more heavily textured cover, a silk bookmark ribbon, special end papers and is autographed by the three primary editors. It was never for sale by the Confederate Stamp Alliance; it was only produced for those who donated $500 or more to the Diamond Anniversary Campaign. Read a few of the many compliments from readers about the award winning CSA Catalog. Winner of the Grand Award for Literature at APS StampShow 2013 in Milwaukee. 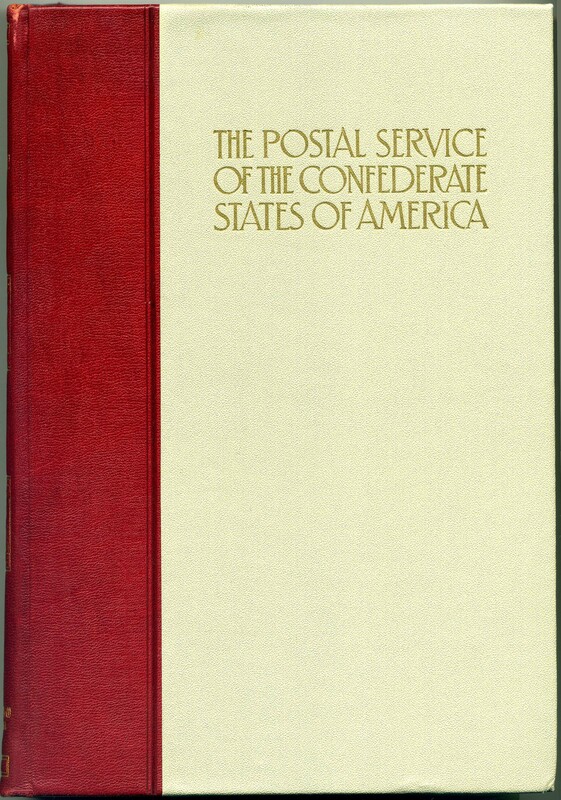 The Postal Service of the Confederate States of America by August Dietz 1929, 439 pages, red leather quarter-bound semi-deluxe library edition with gold lettering. The 1929 Dietz is still the standard work in Confederate philately almost a century after publication (not a catalog). Personal copy of the late Everett C. Erle (1906-1990), a member of the APS Hall of Fame. This is absolutely the most pristine totally intact copy of a library edition that I have ever seen; likely it was rebound but beautifully printed spine certainly appears original. Virtually all library editions have degraded leather. Somehow, this gorgeous copy does not. It is in pristine condition and comes with the original dust jacket, also in excellent condition although a couple minor tears. Came close to keeping this for myself. Photo of spine $325. 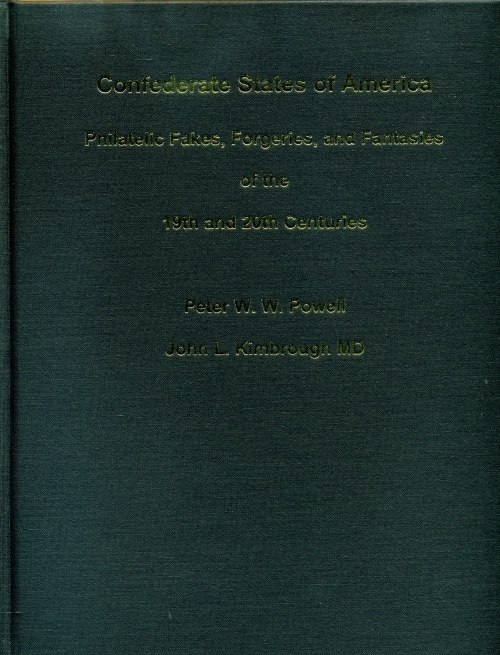 Confederate States of America Philatelic Fakes, Forgeries, and Fantasies of the 19th and 20th Centuries by Peter W. W. Powell and John L. Kimbrough MD, 2015. 8 ½” x 11”, 432 pages plus introductory pages; includes over 150 fake cancellations photographically illustrated in full color and compared to the genuine marking. The descriptions are all original and never before published, including most known John A. Fox Confederate creations. In addition to the fake postmarks, the book also contains profuse illustrations of the fake general issue stamps, fake provisional stamps, and fantasies. $95. 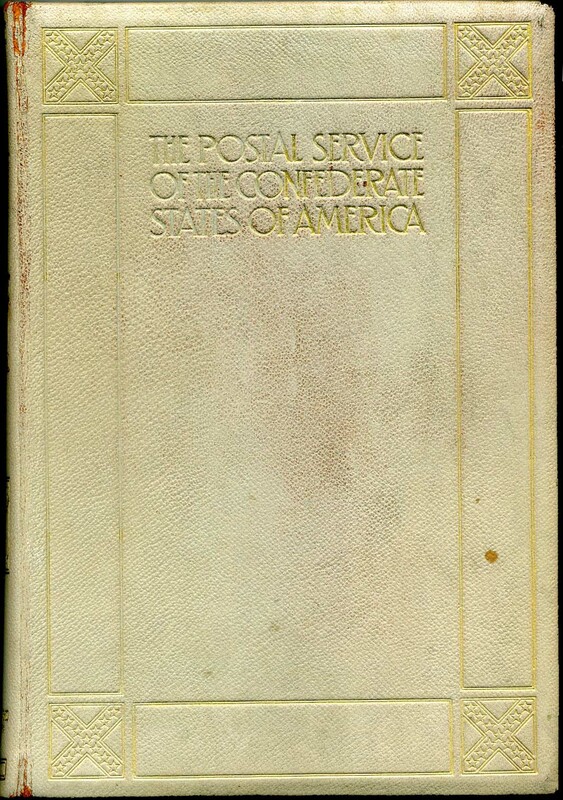 The Postal Service of the Confederate States of America by August Dietz 1929, 439 pages, DELUXE gray leather edition with gold lettering, laid paper, special end papers and special insert of impression from the original Archer & Daly steel plate (which alone sells for $150). The 1929 Dietz is still the standard work in Confederate philately almost a century after publication (not a catalog). Light rubbing and couple of spots, but generally Fine condition. Autographed by Dietz. Ex libris Thomas A. Cox. $650. 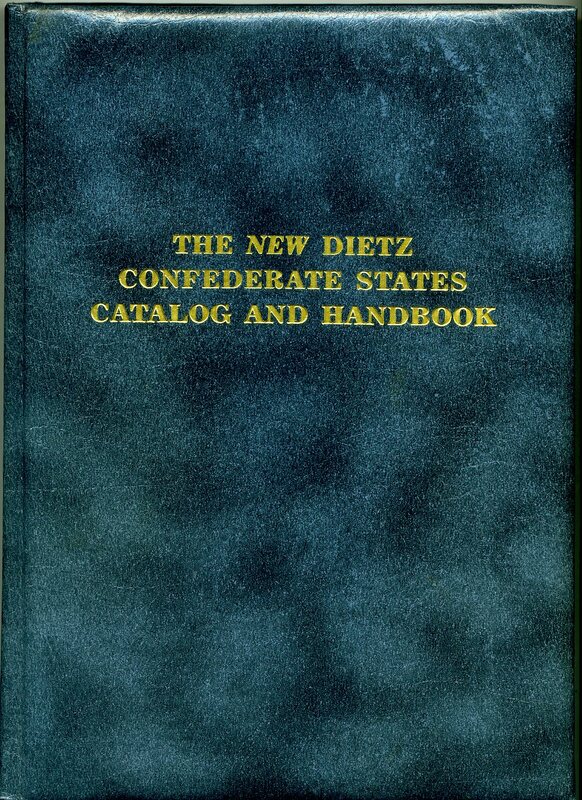 The New Dietz Confederate States Catalog and Handbook by Hubert C. Skinner, Erin R. Gunter, and Warren H. Sanders, 1986, 280 pp, Bogg & Laurence Publishing Company, Inc., Miami, Florida. Deluxe Edition in slipcase with special padded cover, autographed by all 3 editors plus 2 publishers. This is the last in the line of handbooks which bear the Dietz name; the immediate predecessor of the current CSA catalog. $125. 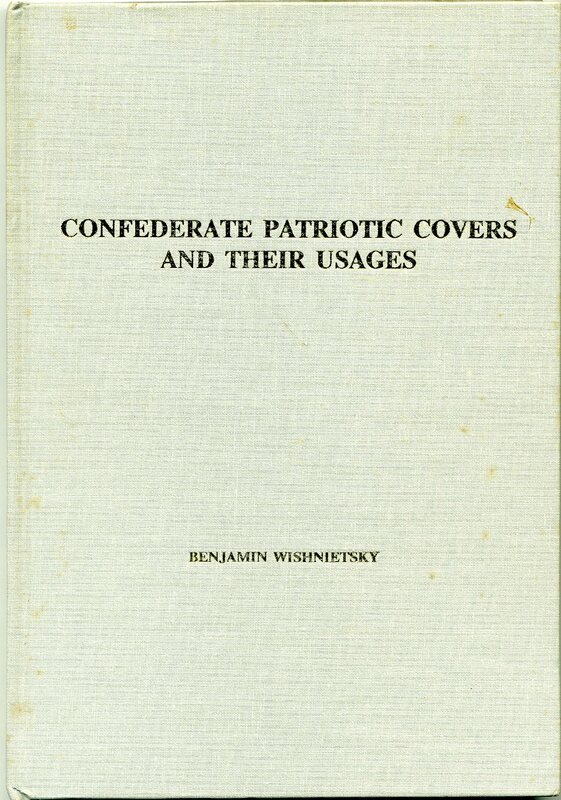 Confederate Patriotic Covers and Their Usages by Benjamin Wishnietsky, 1991, David G. Phillips Publishing Co., Inc., North Miami, Florida, 144 pages, HB, cloth. Over 230 large illustrations of covers, of which over 90 are in full color. Mostly a picture book but the fine illustrations and accurate captions make it useful to the Confederate collector as an other than catalog source. Two available, both with small stains on the covers, otherwise Fine: 17393 (Ex Hanselmann) and 17141. $40. 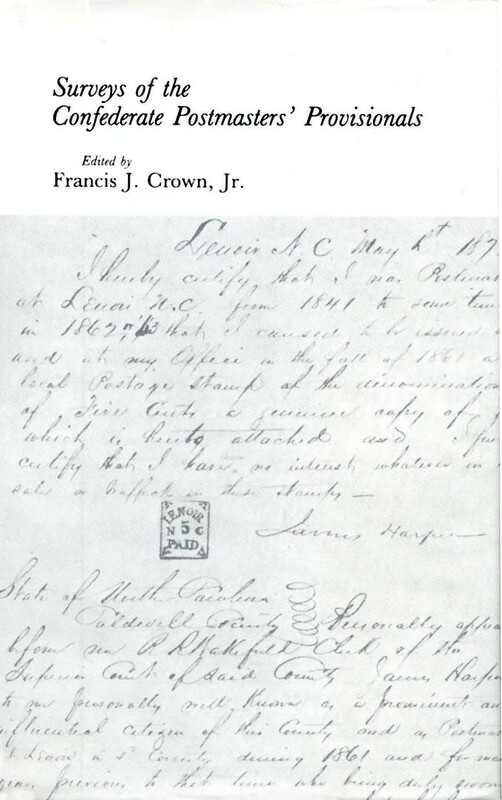 Surveys of the Confederate Postmaster's Provisionals edited by Francis J. Crown, Jr. A reprint / compendium of Charles Phillips' census from the 1930s and the Frank Hart census from the 1950s; illustrations added, as well as the Crown Georgia Survey. A major source for the Confederate student still widely referenced by dealers and collectors; Quarterman Publications, 1984, 742 pages, cloth, dust jacket with and book like new. 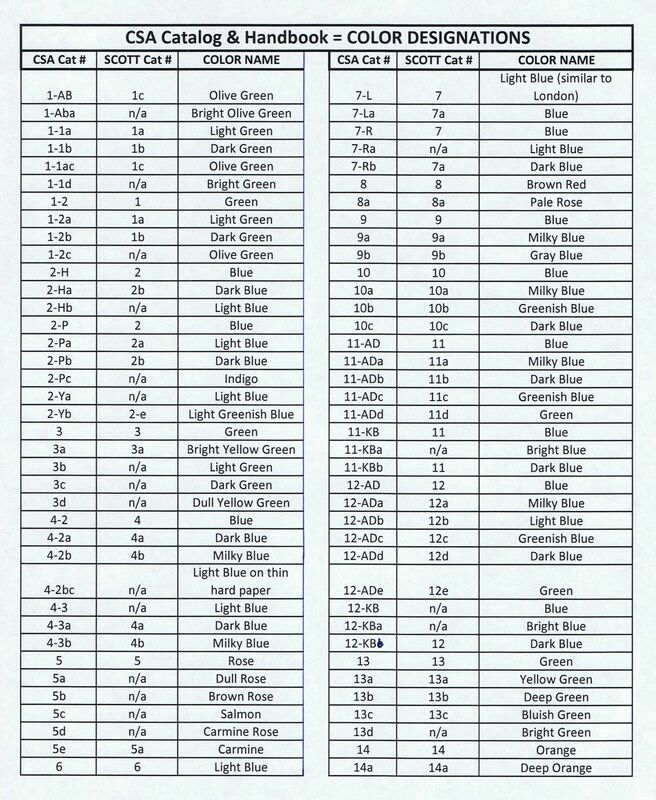 A must for provisional collectors, dealers and serious students. $75. Winner of Large Gold and Reserve Grand at Chicagopex 2018. Hardcover. 120 pages. Most illustrations in full color. First edition was out of print from publisher almost immediately, warranting this second edition, November 2018. $50 plus shipping/handling of $5 within the U.S. This research study addresses the Springfield facsimiles, which were prepared by Howard E. MacIntosh of Tatham Stamp & Coin Co. (TASCO) in 1934. 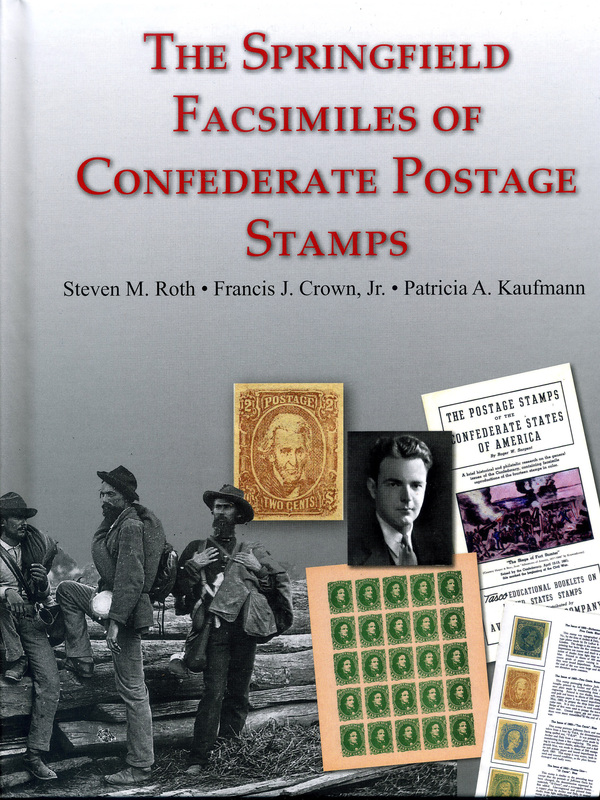 The facsimiles replicate the genuine Confederate stamps and can be dangerous. They are routinely offered as genuine on eBay. See linked page for much more information. 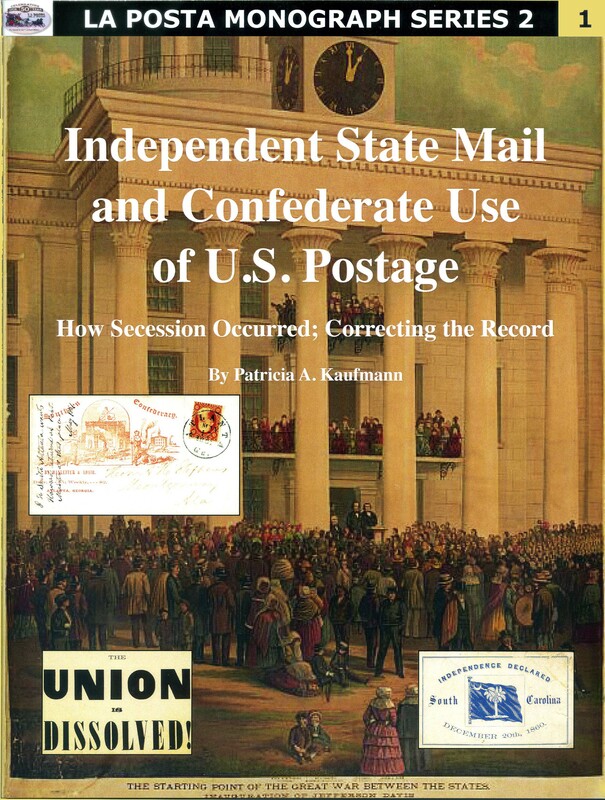 Independent State Mail and Confederate Use of U.S. Postage; How Secession Occurred; Correcting the Record - EXPANDED EDITION. $19.50 postpaid within the U.S., $6 for delivery to U.K., inquire for other destinations. The original version of this article was published as the lead in Aspects of American Postal History in 2017. A short-run offprint of that book article was produced and won a Large Gold with felicitations and the Reserve Grand at Chicagopex 2017. Chief Judge John Hotchner described it as "the gold standard on the subject." In 2018, La Posta: The Journal of American Postal History, celebrates it's 50th year of publication and publisher Peter Martin asked that an expanded version be the first of a new monograph series. The article has been expanded from 24 to 36 pages with new text and new images, widening the scope of the topic, especially on the topics of Arizona and Missouri. 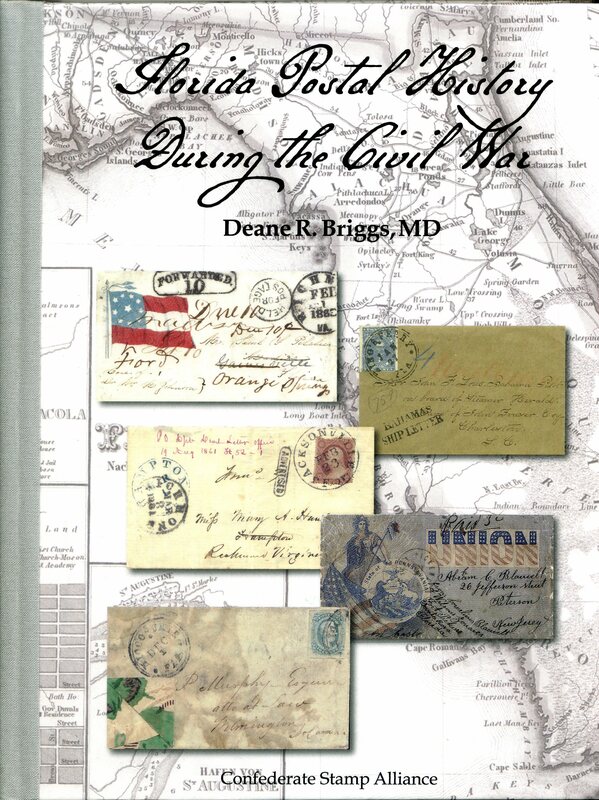 Over the years, a significant number of important dates in Civil War postal history have been incorrectly stated in philatelic publications and online sources. Sadly, these incorrect dates continue to be repeated. 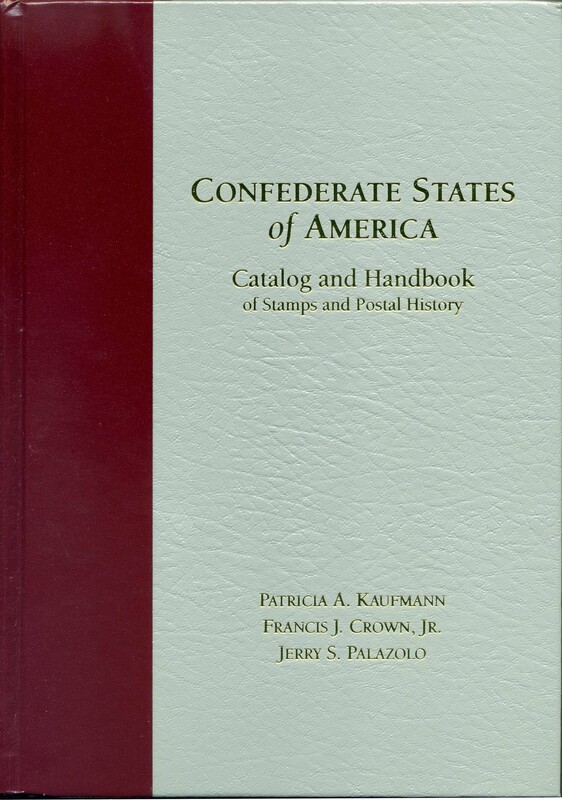 The Confederate States of America Catalog and Handbook of Stamps and Postal History, published in 2012, attempted to right this wrong with a systematic approach and research of the actual laws in place for each state at the time, reexamining the secession and admission processes. This work delves deeper into the subject and leaves no doubt as to the legitimacy of the dates presented.